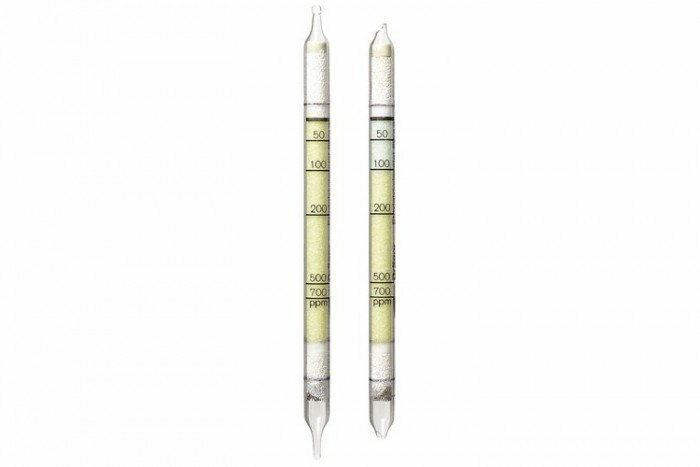 Short Term Detection Tubes, Ethyl Glycol Acetate 50/a (Measurement range: 30 to 50 ppm): Detects a range of substances incl. n-Butanol (Butyl Alcohol), 2-Butoxyethanol, 2-Butoxyethyl Acetate , Butyl Glycol, Diethyl Carbonate, Diethylene Dioxide, Dimethoxyethane, Dimethoxymethane, 1,3-Dimethylbutylacetate, 1,4- Dioxane, 1,3-Dioxolan, Dipentene, Dipropylglycol Methylether, 2-Ethoxyethanol, 2-Ethoxyethyl Acetate , Ethyl Bromacetate, Ethylene Glycol Monobutylether, Ethylene Glycol Monoethylether, Ethylene Glycol Monoethylether - Acetate, Ethylene Glycol Monomethylether, Ethyl Glycol, Ethyl Glycol Acetate, Glycidol, Hexylene Glycol , Isoamyl Alcohol, Isobutyl Acetate, Isopropanol (Isopropyl Alcohol ), Limonene, 2-Methoxyethanol, 2-Methoxyethyl Acetate, 1-Methoxy-2-Propanol, 2-Methoxy-1-Propanol, 1-Methoxyl-2-propylacetate, 2-Methoxyl-1-propylacetate, Methoxy Propoxy Propanol, Methyl Cellosolve, Methyl Cellosove Acetate, Methyl Glycol, Methyl Glycol Acetate, Propan- 2-ol (Iso-propanol), Trimethylphosphate. different sensitivities. It is impossible to differentiate between them.